As a ‘marathoner’ and someone who really enjoys the training, preparation, and actual race day, I’ve set out in 2016 on a new challenge; The Triathlon (and ultimately Ironman). Taking advice from a number of triathlete friends, reading a number of blogs and books and embarking on a Triathlon training regime, I took the plunge and entered the Castle Howard Triathlon on Sunday 24th July. The event, I’ve learnt, is known as the ‘half’; a 1.2M swim, 56M bike and 13.2M run. Having never taken part in a triathlon before and only having experience with the running discipline, I needed to find a good training programme and invest in some additional equipment. The training programme was decided upon pretty quickly. Having read Don Fink’s ‘Be Iron Fit’ book and then Don and wife Melanie’s ‘Ironfit Secrets for Half Iron-Distance Triathlon Success’ I opted for the competitive 16 week training programme. 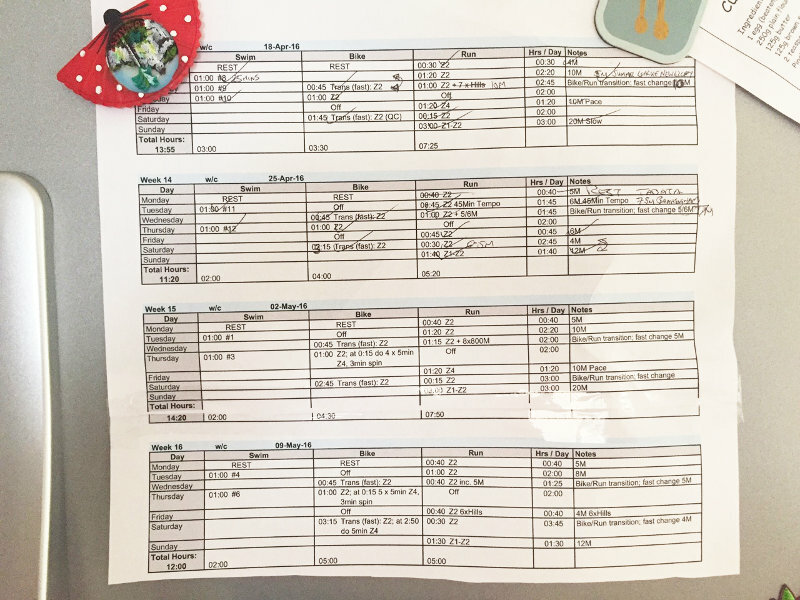 With the training plan sorted (proudly pinned to the fridge door and a second copy on my desk at work) I set about tackling my two weakest disciplines; the swim & the bike. Like I’ve mentioned I am a fairly experienced runner so it was just a matter of sticking to the training plan. Basically this is around 6 runs per week varying in time from 30mins to 3hrs 45mins. Already being a member of a gym with a 20M pool, getting started with the swimming was straight forward. I purchased a pair of swimming trunks and a decent pair of goggles and off I went. The training plan mentioned above sets out the swimming sessions and I am now swimming 2-3 times per week. I have found that swimming is a very technical discipline and all the advice I have been given talks about concentrating on technique ahead of speed. A really useful website I have been directed to is www.swimsmooth.com which has some great videos showing the correct body position, how to breath etc. There is not a lot more to say about the swimming except that I have to stay focused on doing the necessary training and making sure my technique is as good as possible. So, to the bike. The longest section of any triathlon and the discipline that will have the most effect on the time it will take to finish is the cycling. The training plan specifies 3 rides per week varying from 45mins to 3hrs 15mins in time. I have owned a road bike for 2½ years (Ribble, Sportive Bianco, Carbon) but have never done any long distances apart from a 60M charity bike ride in July 2015. Living in the UK the cycling aspect of the training was always going to be affected by the weather. I needed to spend time on the bike so the best way to ensure I got the training done was to use a turbo trainer. I was able to get my hands on a BKOOL Smart Turbo Trainer which was perfect for my training. 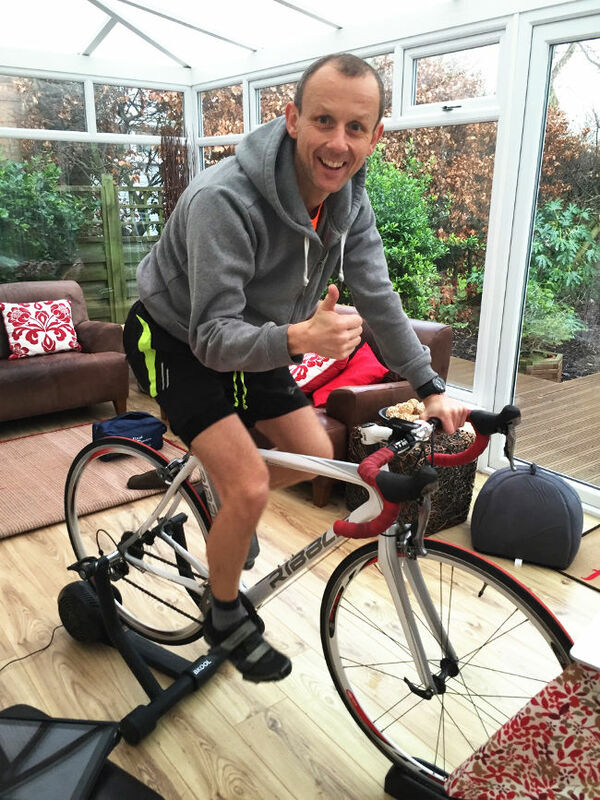 Turbo trainer basics (and my mini-review of the Bkool trainer). The BKOOL Smart Turbo Trainer allows me to put my road bike’s back wheel onto a ‘rolling’ road which adjusts to simulate the gradient of hills. The wheel is fixed in place with two ‘arms’ that lock onto the quick release skewer (provided so you don’t damage your own) that goes through the back wheel hub. Placing the back wheel in place is very straight forward, however I would recommend that you get someone else to hold the front of the bike whilst you do this as the arms have fallen onto my toes on more than one occasion! The trainer comes with a front wheel ‘block’ to place your front wheel in and raises the bike to roughly the same height as the back wheel. I do find myself leaning forward slightly more than I do on the road and believe this is down to the height not being 100% parallel. Once the bike is in position, plug in the power and make sure you extend the base stabilising arms. I forgot to do this the first time I went on the turbo and as I stood up on my pedals for a hill the whole bike and trainer fell to the left with me still clipped in to the pedals. My 9 year old daughter walked into the room and seeing me laid on the floor with bike and trainer on top of me calmly asked ‘what are you doing Dad?’. So the bike is in position, the turbo is switched on and you’re ready to go, well not quite. As the turbo is a ‘Smart’ trainer you will need to download the software and pair this to a PC or Mac using the ANT+ USB stick provided. The software is available as a free download from the BKOOL website http://www.bkool.com/en-GB/cycling-app. Once the software is downloaded you will need to run this and setup a user account. Start by syncing or ‘pairing’ your turbo trainer to your software. To do this you will need to click on the ‘Settings’ button on the top right of the screen. At the next menu page click on ‘Manual device pairing’. Here you will see a list of available devices to ‘pair’. Select the BKOOL Trainer, be patient as this can take up to 90 seconds, once paired the red dot will turn green. If you are having problems pairing your computer to your turbo move them closer together. 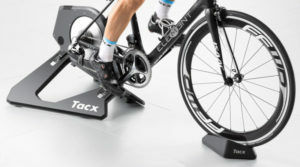 I do find this process frustrating as it seems you have to pair the turbo every time you switch both the computer and the turbo trainer on. However, once you are paired you are almost ready to go! The next step is picking your route or training programme. Using the free software you can only choose the routes and don’t have access to the training programmes. Also, the free software does not let you view the route in 3D. That said, I do believe the statistics you get from the free software are great. Cadence (RPM), Heart Rate (BPM if wearing a heart rate monitor), Power (Watts), Speed (KM/H), Calories (KCAL/H) and my favourite Slope (% gradient). The slope reading is great, as it not only shows you the gradient that you are on, but also what the next gradient is going to be, allowing you to change up or down appropriately in preparation for the hill/downhill. The routes available are also very good and are ranked ‘Easy, Med, Hard’ and show the distance and type of elevation the route passes over. The computer is paired, you’ve selected your route, it’s time to ride! The ride is very realistic when on a low gradient. As soon as the gradient gets above 7% the back wheel tends to ‘churn’ and it does feel somewhat unnatural. The gradient also takes time to take effect in relation to the software, there seems to be a ‘lag’ between the two, however, the overall experience is very realistic. 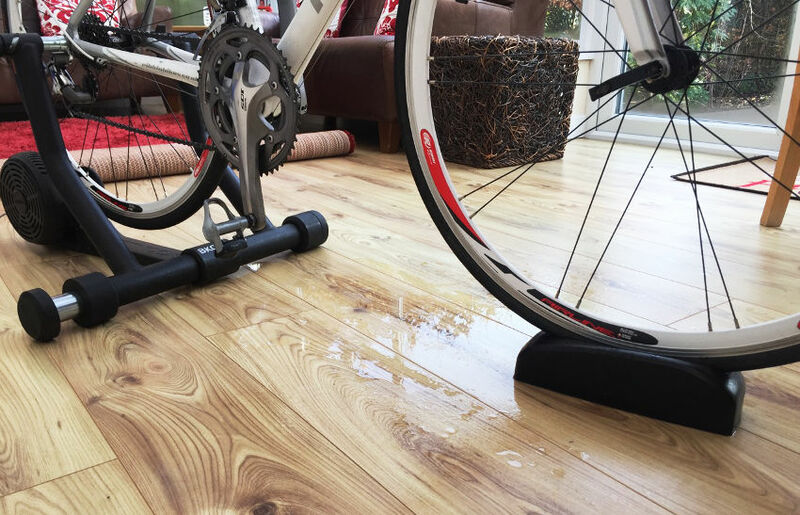 One small tip I will give, is make sure you have a towel either on the floor or over your handle bars or else you will end up with small pools of sweat over your tiles or laminate flooring! The BKOOL Smart Trainer has been a tremendous help with my training so far. I have been using it 2-3 times a week for the last 3 months and do feel it has made a difference when I am out on the road. Training for a triathlon is tough and takes dedication, but if you have a good training plan and the right equipment is it definitely achievable. 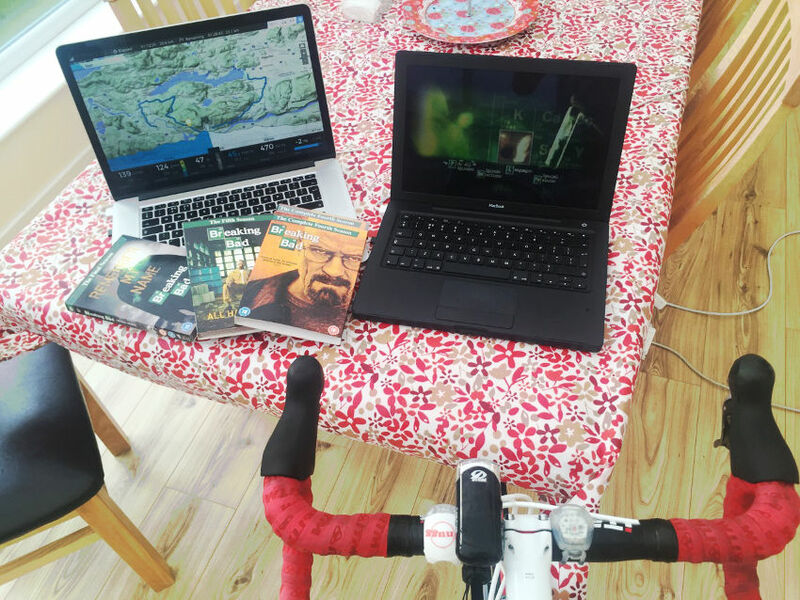 Probably the most important piece of kit for me was the turbo trainer because finding the time to cycle outdoors needed would be very difficult due to weather conditions and fitting it in with my other training and work etc. I’ll update this post when I have completed the triathlon, wish me luck.